That’s a heady cocktail. Like the scepticism around MPs, referenda assume we can’t trust parliament — it shifts the decision from politicians expected to find out facts and deliberate with each other to find a way forward with broad consent, to people coming to positions without the facts or the deliberation. That’s dangerous: lots of people would be tempted to vote “yes” to lower taxes and “yes” to more money for the NHS, but those two contradict and it takes information and deliberation to reconcile them. Writing about processes in groups, Wilfred Bion suggested that, when there’s an unconscious need for a leader, the person who gets mobilised to take up the role is often the most wounded (or dysfunctional) person in the group. His point is that the felt need for “someone” to take on the role emerges, and the person who actually steps into the gap is the person whose pathology means they finally act. There’s a parallel with the way racist feelings can be near the surface in a group, and finally get voiced by the person most easily pressed into the role or cheerleader for racism. They are not necessarily the most racist, but once they have started the attitude spreads if the racism is actually the racism of the group (but one person producing racist language among a group of people who don’t share the feeling would be ignored). A graphic example of this can work out comes from the 1930s. Jung wrote of predicting the coming storm from what his analytic patients were bringing in their dreams: his sense was of something dangerous being going on in the collective unconscious. After the war he suggested that something powerful had been pent up, which had led to such enormous destruction. On that reading, Hitler wasn’t an “evil genius” who somehow stirred up extremism. He was someone who intuited what was going on and put it into words, which enabled it to translate into action. Bion’s point about a group mobilising someone who is deeply wounded/dysfunctional is spot on: to take up that role he also had to be blind to the horror he was unleashing. With worrying echoes of today, Jung describes that as pseudologia phantastica, a “form of hysteria which is characterised by a peculiar talent for believing one’s own lies”. That figure of 74% trusting the military to act in the public interest should also ring alarm bells. The UK doesn’t have a heritage of military coups, so that itself isn’t likely. But the (groundless) anxieties among Leave supporters about a European army talk as if it is an existential threat, and some of their comments give the impression of seeing the EU as an invading power, mobilising stories of war and fuelling anxieties. It gets sharper when one thinks of fascist regimes where the military is seen as an extension of national prestige. Bion also pointed out that a “fight/flight” response is a natural one when people feel deeply threatened / unsettled — I fear that idealising the military also suggests people feeling deeply rattled than is being named. These things offer an interesting perspective on where we now are. One reading of some of the leading proponents of Brexit is that they are guilty of a cynical manipulation of people’s anxieties. But another possibility is that they are corrently intuiting the desperation and lack the wisdom to resist — like the person politician who hears the crowd’s cry for lower taxes and leads the charge for lower taxation, without naming the unpalatable reality that that also means less money for the NHS. From the Brexit side, I am hearing demands to “get on with Brexit”, and demands for money or sovereignty that don’t stack up with reality. That’s the path that leads to the mobilising of a “strong leader” who ignores reality. One of Melanie Klein’s insights is something she called “projective identification”. She was making a distinction between “projection” — when what you think someone is doing or meaning is an expression of your own reality — and the next stage on, when the feelings are so strong that you cause someone to act in a way that justifies your emotions. This might be going on with some of our leading Brexiteer politicians at the moment: with such strong emotions from their supporters that their own rationality disappears. On 9 April there was a news story that Angela Leadsom thinks that Germany might be about to agree to re-opening the Withdrawl Agreement three days before the current deadline for Brexit. At one level, she must know that is not going to happen (especially as the EU is showing every sign of supporting Ireland rather than abandoning Ireland). But her words make sense if they are expressing the not-particularly-rational hopes of those with whom she is in sympathy (a less-charitable reading would suggest an outbreak of pseudologia phantastica). Are we in danger of a “strong (fascist) leader”? The point about a fascist leader is that they meet the raw emotional needs of their followers. The followers, in turn, feel a deep union with the leader who “understands them”. There were flashes of that in the Trump supporters saying that he “says it like it is”. Right now there isn’t an opening for a fascist leader in the UK. Theresa May seems safe in No.10 until the “next stage” of Brexit (whenever that might be). Her apparent weakness might well reflect the dividedness of her cabinet, but she’s still in post. But these things can change quickly. A strong showing from the “Brexit party” in the European elections would strengthen Nigel Farage’s hand. For the moment he seems safely far from power at Westminster though that might change at the next General Election. But among the Tory Brexiteers, Boris Johnson remains a contender for No.10. What’s particularly worrying about this is that his numerous character flaws — from the irregularity of his love life and his apparently-Islamophobic comments on burkas to mis-reportings of expenses among other things, seem not to dent his popularity. That points to a scary gap between his reality and how he is seen. I fear that gap is about what is being projected onto him, and speaks of some powerful needs among Brexit / Tory supporters. 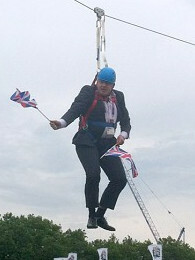 As prime minister he might be more daft than dangerous. But he is well placed to fail to appreciate the risks, and preside over a disastrous Brexit, creating the conditions for something much more serious when the “sunny uplands of Brexit” are replaced by a serious recession. If Brexit were rational, people in that situation people would blame its proponents. But it isn’t rational. The fear is that we would then be susceptible to a Farage or worse. The Hansard Society report should ring big alarm bells. Author Mark ArgentPosted on 10th April 2019 14th April 2019 Categories Bion, Brexit, Dangerous "strong leadership", Jung, Klein, PoliticsTags Brexit, Danger of "strong leadership"
Those wish for strong leaders should read the WHOLE of the Book of Joshua in the Bible. (Joshua is the general who “fit the battle of Jericho, and the walls came-a-tumbling down” (after judicious use of his intelligence experts, and a certain amount of shock and awe) Joshua really was a brilliant General, who took his troops into battle with plans that ensured a quick victory with minimum loss of life. He describes nearly every military tactic that has been used ever since. He was so good that the first part of Joshua is, I understand, still compulsory reading for trainee army officers at Sandhurst. However, as he got older the Government was having problems and appointed Joshua as Governor. And the second part of the Book of Joshua is all about the use of military tactics to solve civil unrest. In short it describes the repeated use of ethnic cleansing. Those who ask for strong leadership should think very carefully about the consequences.